Please also note that whilst we are aware of several that sit on private property in people's gardens, we have not listed them here due to respect of privacy. 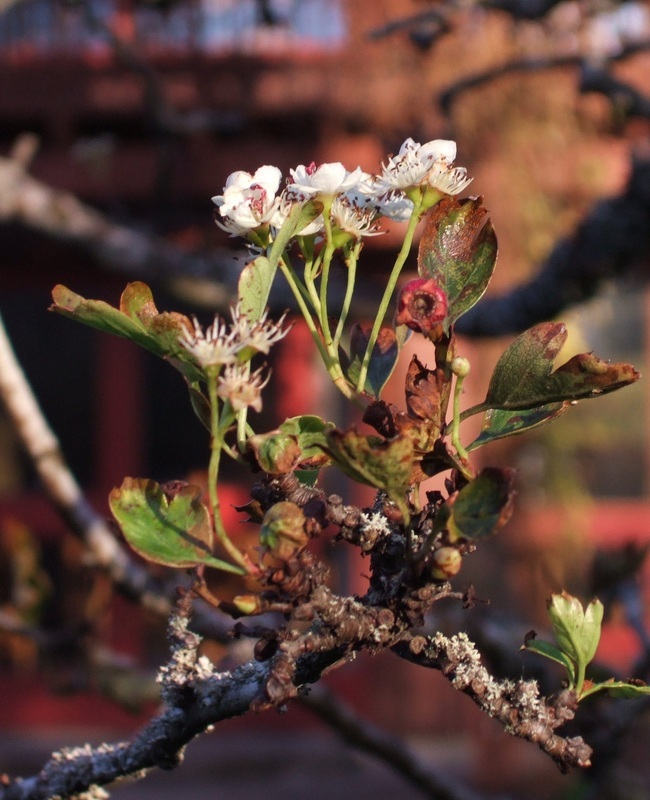 This particular Glastonbury Thorn is 20 miles out of Glastonbury at Ammerdown - a beautiful retreat centre with a focus on peace and reconciliation; this is one of the healthiest specimens that Morgana has seen. 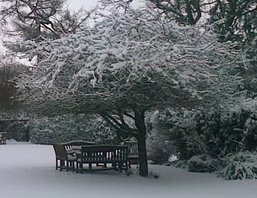 Bedecked in a mantle of snow, it looks just as beautiful as when in blossom. Acton Beauchamp was originally in Worcestershire, but became part of Herefordshire in 1897, and like most other Herefordshire villages it was, and still is mostly a farming community, with many of the cottages being from the 17th and 18th centuries. At one time there was a very old farm house adjacent to a rather spasmodic spring, known as the Roaring Water, and near to this grew a holy thorn which was reputed to be a scion of the one at Glastonbury and which came into flower on Christmas Eve. So many people traipsed over the farmer’s land in order to see this, that he lost patience and destroyed the thorn – after which act he had an rather nasty accident and broke both his arm and his leg. Shortly afterwards, his farm burnt to the ground. 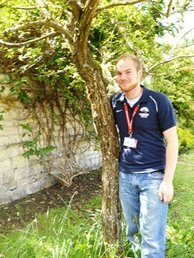 The thorn tree, which stands beside St Cross Church in Appleton Thorn is believed to be an offshoot of the Glastonbury thorn. Adam de Dutton, a knight of the Crusades and local landowner, brought it to Appleton. 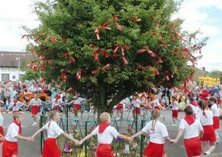 Bawming, which means, “decorating the tree with flowers and ribbons”, takes place each year, whilst local children dance and sing the Bawming song. To visit the official site and find full lyrics, click here. Brudenell House in Quainton, was the rectory in the garden of which was a tree grown from the cutting of the Glastonbury holy thorn. However, the rector, tired of people tramping through his garden, cut it down (1962). However, another thorn has recently been planted in the village as a replacement. Thanks go to Sue Vincent for help in finding this one and for the photograph. 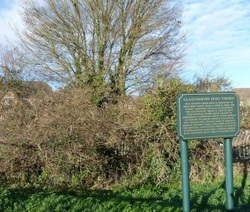 In Quainton, in Buckinghamshire, above two thousand people went, with lanterns and candles, to view a blackthorn in that neighbourhood, and which was remembered to be a slip from the famous Glastonbury thorn, and that it always budded on the 24th, was full blown the next day, and went all off at night. The people finding no appearance of a bud, it was agreed by all, that December 25 (new style) could not be the right Christmas-day, and accordingly refused going to church, and treating their friends on that day as usual: at length the affair became so serious, that the ministers of the neighbouring villages, in order to appease them, thought it prudent to give notice, that the Old Christmas-day should be kept holy as before. 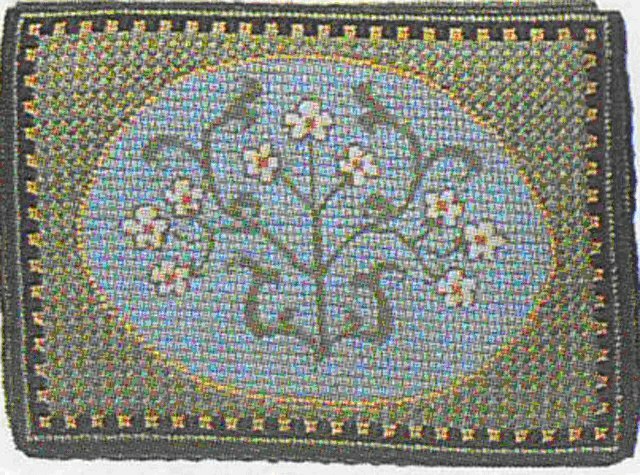 A kneeler, depicting a Glastonbury Thorn in flower, in St. Andrew's church, Much Hadham, Herts. St Peter's Church in Addingham is built on a mound, and some writers have suggested that this was the site of a 'druid temple', for according to one local source the outline of the ancient circle becomes quite distinct after a light sprinkling of snow. A Glastonbury Thorn is planted in the churchyard. 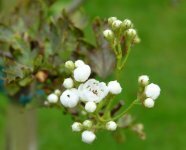 The Orcop thorn was perhaps Herefordshire's most popular thorn, and its blossoming narrowly missed being televised in 1949 when the BBC discovered at the last minute that there was nowhere to plug their lamps into due to electricity having not yet reached Orcop. Sadly, the thorn perished in a storm in 1980.